It was my first time in Portugal, so I made sure to arrive one day early to have time to do some sightseeing and catch a view of Lisbon. Last Tuesday, December 1st, I arrived in Lisbon after a four and a half hour flight with TAP Portugal from Stockholm. First time ever, I had a complementary pick-up service by the event organizers, and a nice driver by the name of Gonsalo. Got back to the hotel again, and treated myself to a nice two-meal dinner in their restaurant. And granted, I was famished by then, but I thought the food was extremely good – especially my starter with Chèvre cheese. Got back to my room, checked some things and then got to bed reasonably early. I got up pretty early, ate breakfast and started my excursion. 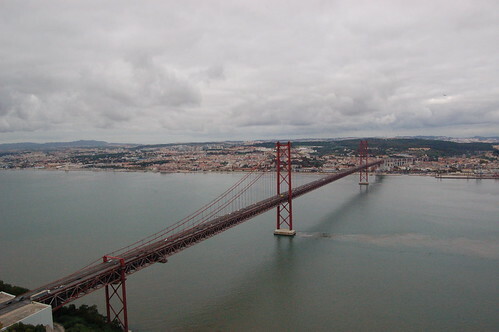 There was a light drizzle and a gale blowing outside, but I had high hopes when I started my walk from the Ponte 25 de Abril bridge and moved further into the Belém area. After about half an hour, the rain just started pouring down. Luckily, there was a ticket station for ferries where I could take cover and wait it out. 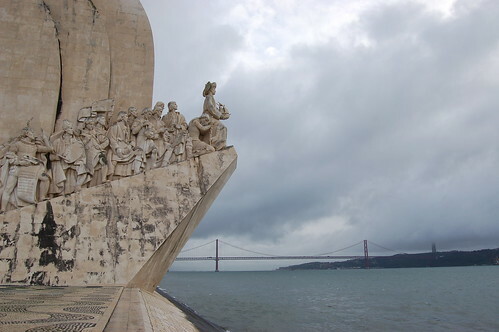 After the rain had stopped, I continued my journey and came upon the Padrão dos Descobrimentos, a monument to celebrate the Portuguese explorers. 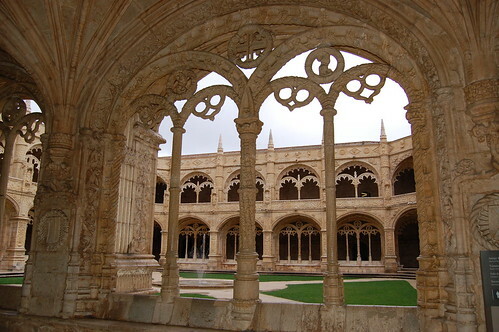 After that I crossed the street and decided to enter the Mosteiro dos Jerónimos, which is a totally beautiful monastery and a cloister – I’ve seen many churches and monasteries during my travels, but I have to say I really loved the colors, ambience and overall feel of this place! 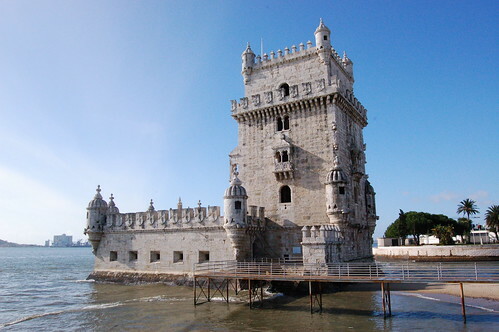 The next stop was the probably most famous landmark in Lisbon, Torre de Belém, which was built as a gateway and defensive tower, located at the entrance of the Tagus river. Quite an impressive building, with some very narrow pathways in places. 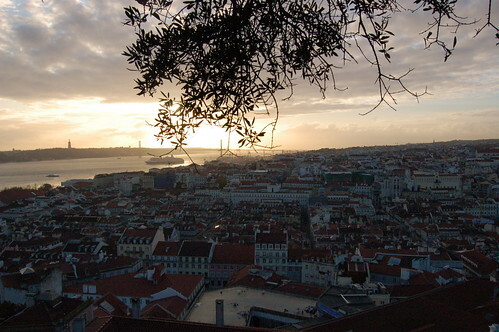 It was also possible to walk the five floors to the top, to get a beautiful view of Lisbon. Kept on wandering around in the area for a while, and then got to the Belém train station to take the train to the downtown area and the Cais do Sodré station. Once there, I looked at some places, like Praça do Comércio, before walking through Arco de Rua Augusta and getting some late lunch. 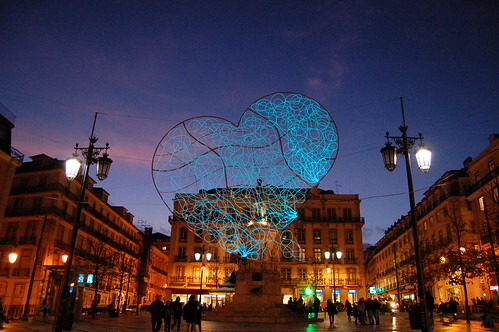 Strolled around in the city and walked up to, and around, Praça do Rossio. Then it was time for some serious uphill hiking to get to Castelo de São Jorge. However, it was well worth it, with lots of nice places to see, a huge great preserved castle and a fantastic view of Lisbon! After an hour up there, I got down again, across where I had been before and on into the Bairro Alto area, old town of Lisbon. Did a little sightseeing there until I, completely tired, sat down in a café where I had an ice-cream and some water. 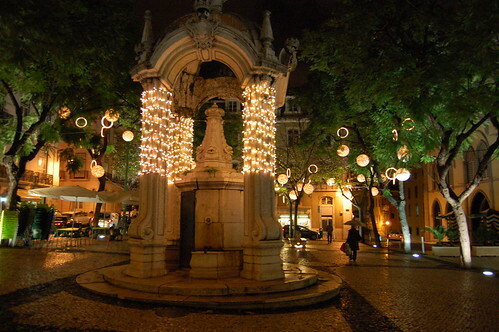 Through the magic of text messaging, I managed to decide a meet-up place with some friends at the Praça Luís de Camões. Once there, under the neon heart, I met up with the Dutch crew: Mike de Boer, Lieke Arends, Ruben Daniels and Rik Arends. I had the pleasure of meeting Mike and Lieke in Brighton for Full Frontal, and now two more from Javeline, the company behind Ajax.org. Some more serious texting going on, back to Praça Luís de Camões and to meet Remy Sharp and Glenn Jones, who had gotten in to Lisbon a few hours earlier. We did a desperate attempt to find a bar that one person (no names) in our company had vague memories about, but it ended up with us just walking further and further away from anything remotely close to a bar. 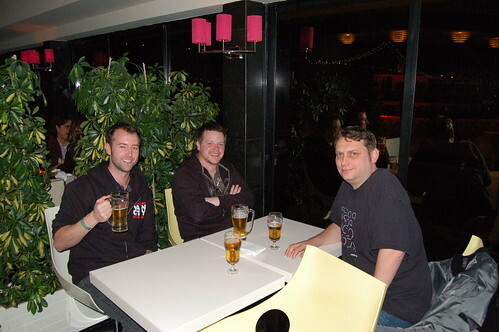 In the end, we took a couple of taxis back to the hotel, and sat down in the hotel bar instead. All of my sightseeing pictures of Lisbon. I decided to sleep in a little, then got up so I was at the venue at around 10.30 or so. Once there, I registered and got a lot of nice giveaways, and then met up with Remy, Glenn and Brian Suda. I envy Brian, and that is because his talks seemed to be just leaps between things that amused him, complemented by beautiful slides. It was quite entertaining, and I was a bit worried to go on after him. My talk. Once I got started, I felt relaxed, and it seemed to go down well with the audience – feels especially good when people seem to get my sense of humor. 🙂 My slides are available at SlideShare. After a talk, it is a lot about winding down, dealing with feedback etc. 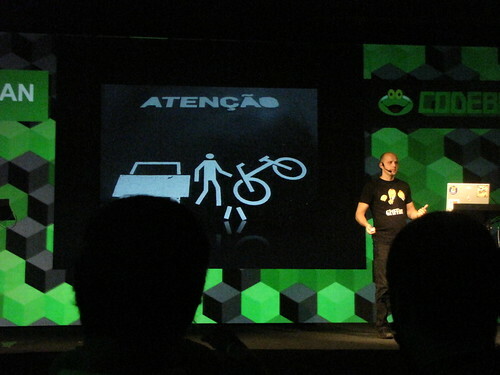 Nevertheless, I wanted to catch Diogo’s presentation, both for the content and that it would be his first presentation in English. I’m quite proud for him being brave enough to take that step, and when it comes to the content, I believe it was a good introduction to what you can do with canvas. Didn’t see this entire presentation, and listened with just one ear doing other stuff, but Pond seems to be an interesting aggregator of content from different web sites/services, and also offer it to all kinds of mobile phones. At around 20.00 in the evening, all speakers were invited to a joint dinner, and we all went on a chartered bus to an, I think, Italian restaurant at the far end of the city. I can’t actually remember if there were a starter (at least we had bread with olives on the side), but we got some good Sangria and then a main course with meat and rice, followed by a nice desert. Got some nice chats with Glenn, Ruben, Remy and Brian Suda. After dinner, we spent some short time at the venue (read: free WiFi to check some things), and then got back to the hotel to get some sleep at about midnight. So far, not really any late evening. Good for being rested, but unusual for a conference. Got up fairly early because I wanted to catch the first presentation of the day: Rik of Ajax.org. The first half of Rik’s talk was more philosophical/theoretical and dealed with the background of development and different layers. Personally, I preferred the second half, since then he started to show code and demos of some cool things they have been working on with Ajax.org. Got to Glenn’s talk a little late, but it was quite interesting in the sense about reusing already existing data about people on the web. His Ident Engine seems quite cool! Poor Brian was jetlagged out of his mind, so he missed his actual slot. No worries, it got postponed, and once he gave it, it was an interesting view into the state of development for mobile phones, and also about what PhoneGap can offer in that area. Between Glenn’s and Brian LeRoux’s talk, the extremely friendly Diogo Antunes took me in his car across the Ponte 25 de Abril bridge so I would get the chance to see the Monumento ao Cristo Rei and get a good view of the city from across the river. The monument was quite high, and we took an elevator up to the foot of the actual statue, where the vista in all directions was quite nice! 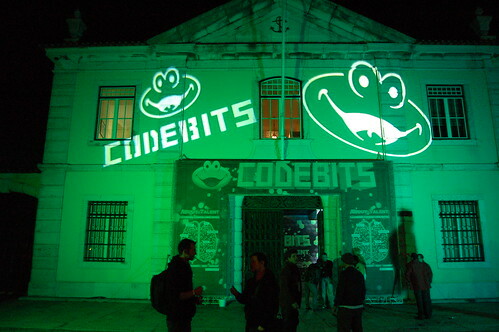 All of my pictures of the Codebits conference. We then got back to the venue to see a few songs of the band playing, Pornophonique, before we headed downtown. 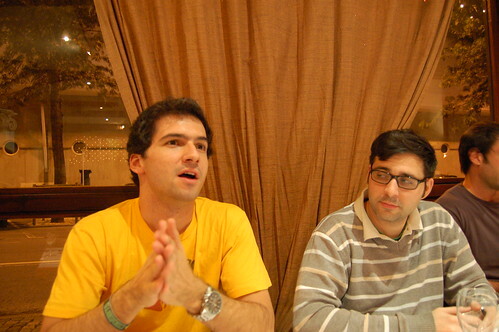 First it was us in the dinner-company + Kai Sedler, and we found a great pub in the Bairro Alto area. You’d buy your drink within the pub and then stand in a narrow street drinking it, and the street was totally packed (and yet, got even more crowded as the night went along). Again, some texting, and we were joined by Mike de Boer, Ruben, Lieke and Rik, to form quite a big group of people hanging out and chatting. The interesting part, though, was that cars insisted on driving down this road, and it was almost impossible for them to come past all the people standing there drinking. At first, we thought it was due to some general GPS error/misinformation, but when a number of taxis came down that way too, it seemed like it would have to be the best option for them out of a number must-be poor ones. At about two in the morning, I felt I really had to get back to the hotel to get a few hours of sleep before going home. Got back to the hotel room, packed, and slept maybe three hours, before I got up at six in the morning to go to the airport. My driver, Antonio (I think), was really a nice guy and given the time of day, he was quite chatty. 🙂 We had some interesting conversations and discussed values, before I arrived at the airport. After such a great time in Lisbon with lots of nice people, it was a bit disheartening to see the Lisbon airport in action. Everything had a long line and seemed to go extremely slow: check-in, baggage drop, security, just buying something in any store… Anyway, since my plane was a bit late, I got enough time to endure the queueing and bought some gifts for my family. Got some random sleep on the plane, and then finally I was home again. Till next time Lisbon: thanks for a great conference! It was very nice meeting you, great fun. Because of your tweets on airport delays we got there really early and it took about 10 minutes to get from checkin to behind the security :). I guess you just had bad luck (or we were lucky). Nice pictures by the way. Looks like it was a fantastic trip. Thank you for sharing your experience from my Country, although i am from Porto. But yes, I had a great time!